The big kahuna of communication methods, Skype allows you to call your assignee and video chat with them over the internet. It’s a free way to see their smiling face and communicate directly. Even in the most remote parts of the world, Skype helps keep your assignee on the grid and in communication. Skype has another great feature where you can use their services to call any mobile and landline phone for a small fee. International texting got a lot easier when WhatsApp was introduced. This app allows you to text message any other phone anywhere in the world over the internet, letting you bypass long-distance fees. For the assignee who you just can’t get on the phone, a quick message from WhatsApp lets them know you’re still there for them. While the last two apps are great, sometimes your assignee can’t find the WiFi they often need to make free calls—and that’s where WiFiFinder comes in. A simple app powered by a smartphone’s GPS, WiFiFinder shows the closest wifi hotspots, their location type and whether or not they’re free. With over 650,000 locations in 144 countries, your assignee will never have an excuse for not emailing you back. Is your assignee in Papua New Guinea frantic to get in touch with their grandma back in Kansas City, but grandma’s never used the internet? Hook them up with Textfree from Pinger, an app that gives the user an alternate US mobile number from which they can send messages and call any US number for up to 10 minutes. While the time limit is a bit of a bummer, this is one of the only apps out there that allows calls to people who don’t have smartphones. What else did you think we were going to say? Mango’s official app lets an assignee keep their language-learning lessons with them wherever they may be. Since it’s entirely offline, they can brush up on their Russian anywhere from St. Petersburg to Novosibirsk without having to worry about connectivity. Хорошо! Being unable to talk with loved ones is a major stressor for those abroad, which can lead for feelings of isolation and culture shock. 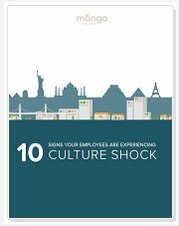 For more on how you can help assignees stay calm, cool and connected when they’re on reassignment, check out our checklist of 10 Signs You’re Experiencing Culture Shock!